You know the satisfaction you get from seeing all the gunk that comes off on a Biore nose strip? It’s a mix of delight and omigod I can’t believe that crap is IN my face. That was EXACTLY how I felt when I saw all the dead skin cells and blackheads that were in my filter after a 30-minute microdermabrasion facial. The nice people at DLK on Avenue invited me to try out my first Microdermabrasion facial last week at their super sleek Yorkville medi-spa. I was expecting to be exfoliated by magic crystals that would leave my skin red and raw. Not so. Dermatologist, Dr. Lisa Kellett and her team uses a newer, more advanced technology called the Diamond Peel ($150) that uses a fine sandpaper-like diamond tip attached to a suctioning vacuum pen. I mean, who doesn’t want diamonds all over their face? The pen is moved over the face several times to reveal new skin and to unclog pores. Apparently my dead skin cells were coming off in chunks! My biggest concern was whether this whole process would hurt. Not only did it not hurt, I practically fell asleep during my treatment and woke up completely relaxed and refreshed. With Microdermabrasion, you can wear make up right away but should avoid strenuous exercise that would result in lots of sweat (think hot yoga). Lucky for me, I don’t have that problem. I left the spa feeling a little bit tender and red from all the blood circulating through my face. After about 20 minutes the redness faded and my skin was glowing, looking clear and healthy. Once all that dead skin is gone, make up will go on smoother and skincare products will be absorbed more deeply. The staff are all incredibly friendly and will walk you through the entire process if anything makes you uncomfortable at all. 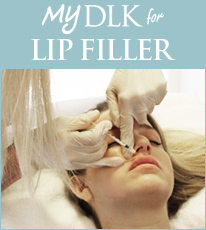 Everyone who works at DLK has incredible skin and swears by the Microdermabrasion treatment. Recommended treatment is once every two weeks and I would definitely do again, but probably once a month.